There are those who go through life without an estate plan because they feel as though they have plenty of time to address the matter in the future. This is a gambler’s mentality because the reality is that we are all “day-to-day” as they say. When you make this type of gamble you are not putting yourself at risk; it is your family members who would be left behind to sort through details that you should have taken care of in advance. Some feel as though their affairs are not that complex and that everything will just take care of itself after they pass away. In reality, things do not take care of themselves and every responsible adult should have at least a basic, core estate plan in place. If you have no idea where to begin, the logical course of action would be to arrange for a consultation with an estate planning attorney. He or she will evaluate your situation and the nature of your wishes and make the appropriate recommendations so that your family is not left completely unprepared. There are two elements that are included in just about every estate plan. Of course you’re going to need a vehicle of asset transfer, and people are most familiar with the last will as an asset transfer vehicle. However, this is not your only option. 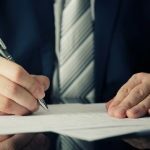 There are many advantages to the creation of a revocable living trust, and this is something that you would want to discuss with your estate planning attorney. You’re also going to want to have advance health care directives in place. One of these is a living will, and with this document you elucidate your preferences with regard to the medical procedures you would accept or deny in the event your incapacitation. Another advance directive that is highly recommended is a durable medical power of attorney. With this document you empower an individual of your choosing to act in your behalf should you become unable to make your own medical decisions in real-time.